Caramel Cake is a Southern Classic, and also the cake I baked myself for my Birthday. If you were raised in the South more than likely you're familiar with this traditional cake, but if you're not this one's for you. 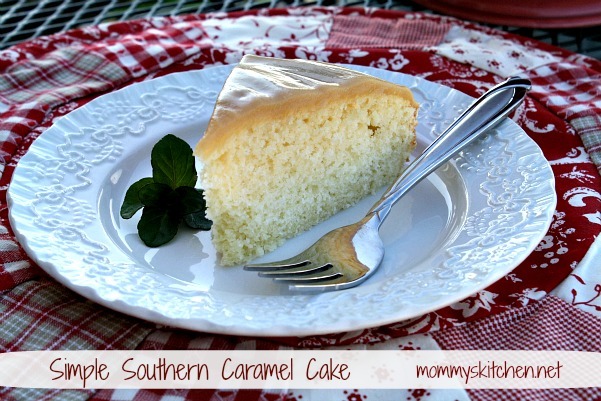 A Southern Caramel Cake is a homemade butter layer cake that is topped with a decadent boiled caramel icing. Heavenly if you ask me. If you saw the movie The Help than you might remember this cake mentioned several times throughout the movie. There was even a quick glimpse of this beautiful cake at the end of the movie gracing Celia's table. 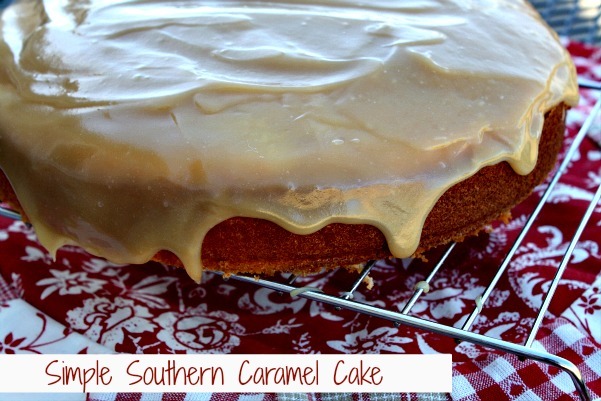 By far a classic caramel cake is my favorite of Southern Cakes. A traditional caramel cake is usually three or more layers, but I love this simple version best. If I made a full three layer cake, my family would devour the entire cake all on their own. It's that good folks! I found this tried and true recipe in the January 2008 edition of Gourmet magazine. It's pretty much the only caramel cake I will make. If I do go all out and bake an eye catching three layer caramel cake then I usually double this recipe or use Scott Peacock's Caramel Cake recipe. I do make make one change in Scott's recipe and substitute buttermilk in place of regular milk. I like baking with buttermilk especially in cakes. Try it next time and you'll be pleasantly surprised. In my opinion using buttermilk in a cake or cobbler recipe can take it from GOOD to GREAT! I hope you will give this simple version a try. Preheat oven to 350°F with rack in middle. Grease and flour a 8-inch round cake pan. You can also place a piece of greased parchment paper (cut into a circle) in the bottom of the cake pan. Sift together flour, baking powder, baking soda, and salt. Beat butter and sugar in a large bowl with an electric mixer at medium speed until pale and fluffy, then beat in vanilla. Add eggs 1 at a time, beating well after each addition. At low speed, beat in buttermilk until just combined (mixture may look curdled). Add flour mixture in 3 batches, mixing until each addition is just incorporated. Spread batter evenly in cake pan, then rap pan on counter several times to eliminate air bubbles. Bake until golden and a toothpick inserted in center of cake comes out clean, 35 to 40 minutes. Cool in pan on a baking rack for 10 minutes, then run a knife around edge of pan. Invert onto rack and flip cake so it is right-side up and then cool completely, about 1 hour. If using parchment paper make sure to peel it off. To Make glaze: Bring cream, brown sugar, corn syrup, and a pinch of salt to a boil in a 1 1/2-quart heavy saucepan over medium heat, stirring until sugar has dissolved. Boil until glaze registers 210 to 212°F on a candy thermometer, (about 12 to 14 minutes) then stir in the vanilla. Place the cake on a baking rack with a plate underneath and pour hot glaze over top of cake, allowing it to run down sides. Cool until glaze is set, about 30 minutes. I have included a few step by step photos of the the boiled icing. You will need a candy thermometer when making this icing. Once the icing is at the perfect consistency. Pour it all over the top of the cake and let it run down the sides. Goodness that's my favorite part. Enjoy! This looks so good. Damn Weight Watchers. After chocolate, my favorite flavor is caramel!! This looks mouth-watering! And I love that it's a single layer...with gooey frosting. =D Pinning! And hope to make one day soon. Thanks so much for sharing. This looks fabulous. I had seen a caramel cake on Trisha Yearwood's food tv show and she kept saying over and over that the caramel frosting was so tricky. How easy is yours? Is it temperamental or as long as you have the thermometer, it works fine? I think as long as you use a thermometer you will be fine. Boiled frosting can be kind of tricky, but the first time I attempted this recipe years ago. I nailed it on the first try. You want a pourable consistency yet somewhat thick. After "caramel", the word that sold this post to me was "SIMPLE". A simple recipe's exactly what I need as I'm hopeless in the kitchen, so thank you! Hi Tina! 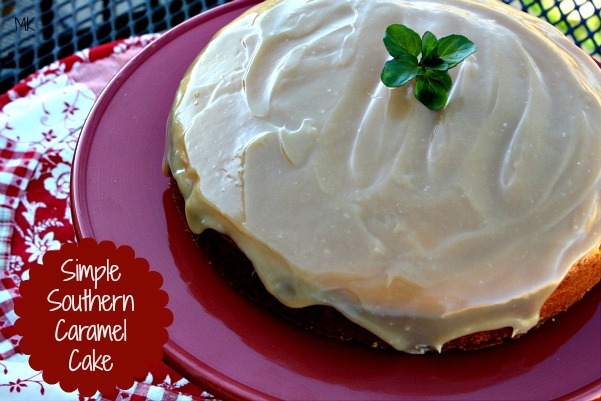 My Grandmother used to always make a caramel cake! They were three layers and so delicious! Thanks for bringing back good memories! Blessings from Bama! I have been looking for a caramel frosting Ike this for years! So excited to try this one. Thank you for sharing. I forgot this cake ..my mom always made this..DELICIOUS!!!! Thank you for bringing back memories!!! 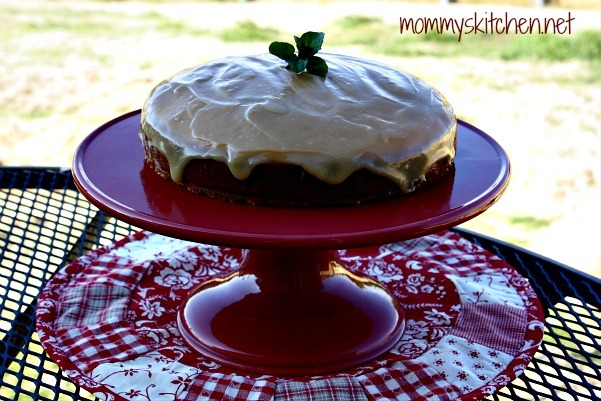 I make this cake but add a table spoon of pumpkin pie spice....love a good spice cake with cameral glaze. My grandmother did the triple layer as well. The glaze was between gooey and flakey. It was the absolute best. She always made one for my birthday.